If you’re taking a trip to Paris everyone will tell you that you must go to the top of the Eiffel tower, take a boat ride along the Seine, visit the Louve, see the Arc de Triomphe, walk down the Champs-Élysées, and of course see the bones of the more than 6 million Parisians buried under the city in the catacombs. But when it comes to food, what should you eat in Paris? 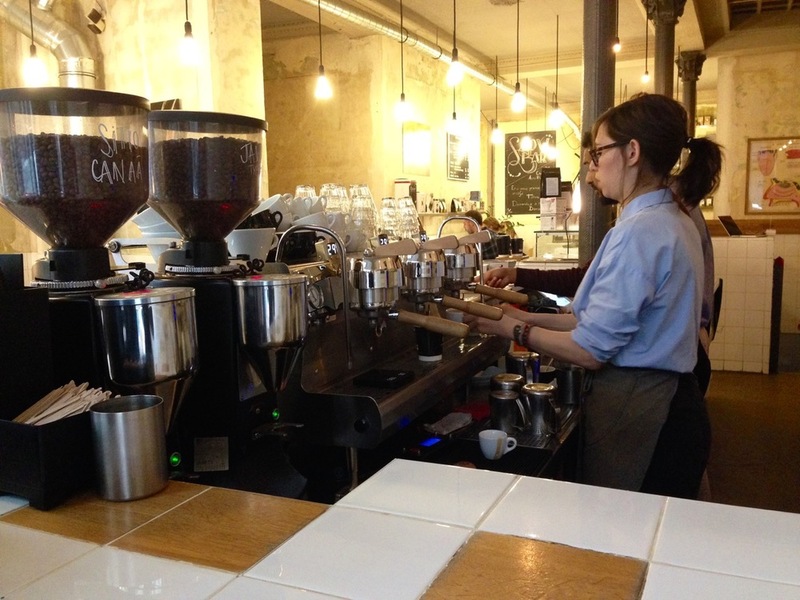 Start any day in Paris off on the right foot by heading to this coffee shop. It's not famous because of the artists or writers who drank their coffee here while creating their masterpieces, it's famous because it's freaking good coffee. Coutume Café focuses on finding the best beans, buying direct, and roasting to perfection (one of their founders, Antoine Nétien, was named the best French roaster of the year in 2011). If you're looking to eat, they also have a menu of breakfast and lunch items, as well as a few pastries to choose from. Though I didn't experience it first hand, I've heard great things about their Sunday brunch menu (and since Nutella banana pancakes are on their regular menu, it can't be bad). If you're looking for a great bunch spot, I strongly recommend Holybelly which I wrote about here. Frenchie's is a set of three restaurants neighboring each other along a small alleyway and you should let the size of your wallet determine which restaurant you try. At Frenchie's to Go (the most budget friendly Frenchie option), lunch for two ran us 45€, but it was well worth it. We had a pulled pork sandwich, a pastrami sandwich, french fries, drinks, and a coffee and let's just say that compared to my latest experience with a pulled pork sandwich, it was night and day. They also have a great looking breakfast menu. I really wanted to try their fried egg sandwich, but given our limited time and stomach capacity, compromises had to be made. Next time. If you go to one wine and cheese shop in Paris, go to this one. Choose to sit in their cellar (14 seats, call for a reservation), or order your wine and cheese to go. We snagged the last two seats in their dining area one evening and started our dinner. They don't really have a menu, so you can make your selections by looking at the meat and cheeses in their fridge and wine on the wall or you can do what we did: we told our server what we liked and he brought us 3 bottles of wine to choose from and suggested a few different cheeses. It was bomb and it was only 60€. Our biggest regret was not buying more of everything to eat and drink for lunch the next day. As an aside, the 2005 Bordeux we had here was hands down our favorite wine in Paris. They also had the best bread in Paris. Just go there. You'll understand. Runners up: If you're looking for other wine and cheese places, we also went to L'Affineur Affine (9th) and Chez Nous (6th) and both were great. L'Affineur is better if you're just in it for the cheese (pick an assorted 5, 10, or 15 cheese plate) and Chez Nous is more of a nightlife hot spot (and their tapas-style food menu is all in French, so just be prepared), but both were also great. La Vache dans les Vigne wins the highest recommendation because of their personalized attention, on point recommendations, and best all around experience. If you look up much of anything about eating in Paris you're going to run across a recommendation for Angelina. To be honest, this made me skeptical. And when Tony and I saw the line out front I almost suggested we skip it. Don't you dare skip Angelina. I literally never knew hot chocolate could be so delicious. For 4.9€ (to go) you will get a full cup of what tastes like the inside of chocolate lava cake. Go there and don't share. 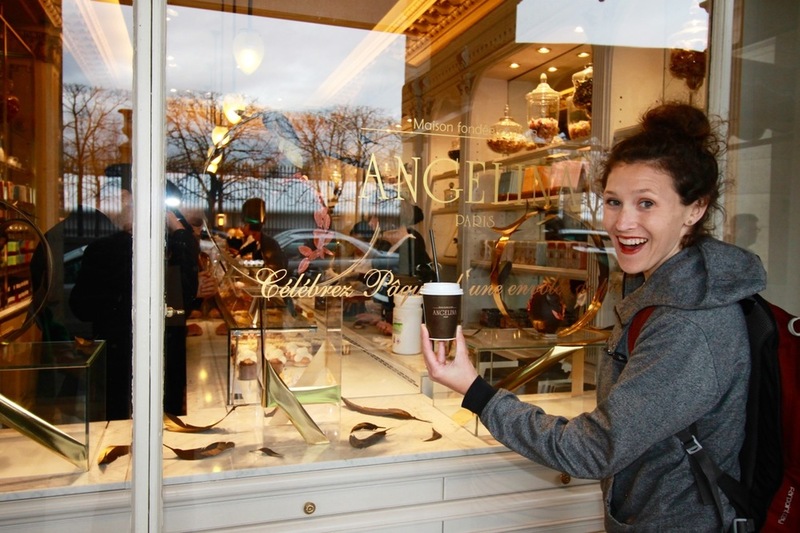 Hint: If you just want your hot chocolate to go, you can skip the line and head right to the pastry counter, but be warned that this means you will almost certainly end up buying a pastry. There are worse things in life. Their chocolate eclair was also incredible. Worth 5.40€? I'm not sure, but probably. Their original location is on Rue de Rivoli in the first arrondissement, but they now have locations all over Paris and unless you're dying to say you went to the original, stop by any of them for a decadent hot chocolate dessert. 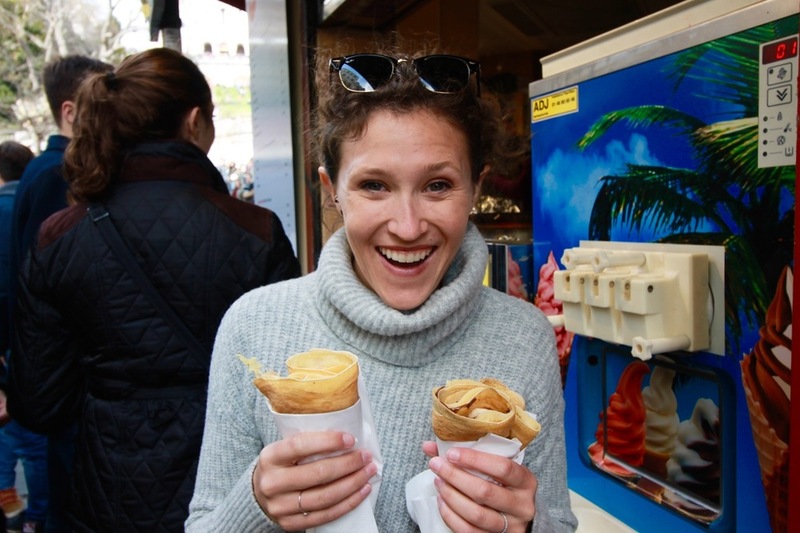 I'm sure there are delicious crepes at sit down restaurants all over Paris, but there are also street crepes on every other corner and we opted for the latter. The important thing is to get a crepe. Or two. Or ten. I'm not judging. I recommend getting at least one savory and one sweet crepe. We had a ham and cheese as well as a nutella and banana. In my opinion you should make sure the stand is making the crepes fresh rather than reheating, but other than that, take your pick and enjoy. Paris is a double edged sword for a quick trip because it's a huge city, but you also can't really go wrong. For your visit, know that many of the things you'll want to do and see are spread out all over. To see the Eiffel tower, the Louve, the Arc de Triumph, and the Catacombs you'll need to go to the 7th, 1st, 8th, and 14th arrondissements and that only scratches the surface of all there is to do. Make a list of all of the potential places you want to eat and all of the places you want to visit and note which Arrondissement each is in. Or, if you're going to play the trip more by ear, just keep the list with you so that when you end up in the 18th visiting the Basilica of the Sacred Heart, you then wander around the Montmartre district rather than running all of the way across the city to your next destination. Again, while in Paris you really can do no wrong, but if you're a planner like me, you'll want to be prepared for whatever adventure you end up on :).